BALTIMORE, Md. — When you hit the century mark it's a big deal. “Aw man, it's not just hype. It's all real,” said Calvert Hall Head Football Coach Donald Davis. “Just being a part of this rivalry is exciting,” added Loyola Blakefield Head Football Coach Anthony Zehyoue. The annual Thanksgiving Day high school football game between Calvert Hall College High School and Loyola Blakefield was celebrated downtown on Monday by both the Cardinals and the Dons. “Three words: Never, gets, old. It never gets old,” said Davis. 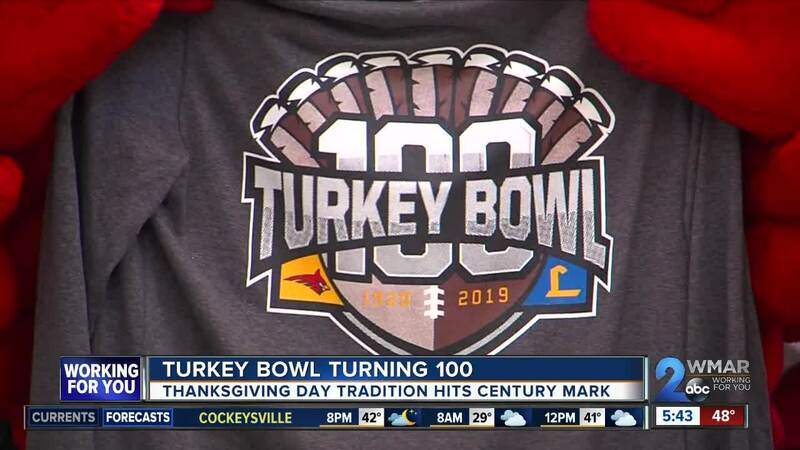 The Turkey Bowl is the longest-running catholic school Thanksgiving Day rivalry in the nation. For the 100th edition the schools unveiled a new logo for the contest. They also announced they will celebrate the tradition with a reception in October to bring alumni and fans from both schools together in one place. Two of the most notable men associated with the Turkey Bowl, long time Calvert Hall Head Coach Augie Miceli and long time Loyola Head Coach Joe Brune, were in attendance on Monday. Hundreds will once again gather on November 28 at Towson University's Johnny Unitas Stadium to see who will be the next to capture the Alumni Memorial Trophy. The Turkey Bowl will once again air live on WMAR-TV and stream online at wmar2news.com.